The warning signs of toxic leadership start with well-meaning individuals doing what they think is right. That’s why we’re calling out the early signs in this 12-part series about behaviors that derail careers, ruin reputations, and adversely impact work teams. We’re taking one behavior set at a time, framed as personas. These are the 12 most-common ways that people get stalled out in their careers. When someone has ascended into a position of senior management and influence, the impact is far-reaching. Unfortunately, most of these behaviors are blind spots for the people exhibiting them. That’s why you owe it to yourself to objectively step back and consider whether or not any of these personas might be a problem for you. Are you an at-all-costs corporate climber? Warning Signs of Toxic Leadership: Are You The Climber? You know how to toot your own horn. You are looking out for number one. You’ve earned it, and t’s time to take your turn in the spotlight… so you do. Your M.O. is to figure out how to climb the corporate ladder fast as possible. Maybe you don’t really see yourself as self-congratulatory or overtly ambitious. But you suspect others may perceive you this way. They might be wrong about you. Nonetheless, if this is the perception, it affects how people interact with you. Is overly ambitious and focused on career advancement at any cost. Jockeys for position and elbows into conversations and situations where you can be seen. Manages up to gain favor with senior management. Makes choices that are political and self-serving without regard for the impact on others. Takes credit and deflects blame to position yourself favorably. Visibility was essential for distinguishing yourself from others. Your contributions and accomplishments had not yet been recognized. You were in an environment where “looking out for #1” was a means of survival. Career advancement was solely dependent on forming relationships. Networking and forming professional connections and relationships. Maybe this persona isn’t who you really are. It’s not who you intend to be. It feels unfair to be labeled this way. Nonetheless, if people see you as The Climber, something caused them to see you this way. For them, this is real. What if This Description Fits, and I Might Be The Climber? 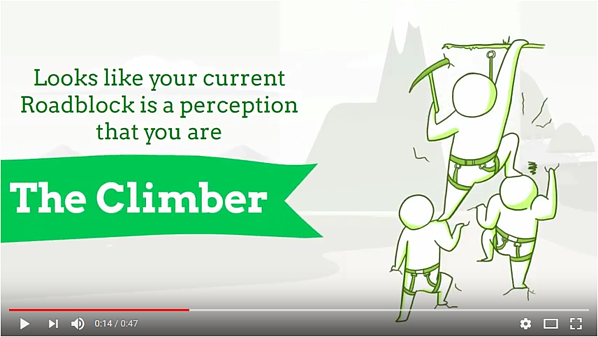 If you are, indeed, The Climber (the above video may help you decide! ), here are immediate actions you can take to change others’ perceptions and exhibit these behaviors less frequently. Let your standout performance speak for itself. Choose an approach that is subtle in your quest for the right connections. Share credit for work done in groups. Be sure to recognize others for their contributions. Help others get recognition, relationships, and career advancement opportunities. If you’re wondering whether or not it’s worth it to make these changes, you should know that there is an impact to being perceived as an overambitious corporate climber. There’s an impact on people you work with. The biggest risk you take when you allow Climber behaviors to go unchecked is that people will not trust your motives. You’ll be excluded. For upper management, this will make it seem that you’re not a team player who gets along well with others. No matter how stellar your achievements, others will hold back on acknowledging you, figuring that you’ll do enough for yourself to reap the glory and rewards. Some may consider you to be rude or presumptuous if you try too hard to be recognized and included. Jockeying for position or inserting yourself in conversations may backfire and cause others to distance themselves. The harder you try to get closer, the more they resist. You also run the risk of not getting recognized, long term, for your abilities and contributions. Instead, it may appear that promotions and opportunities were given to you for political reasons alone. The Climber is one of 12 behavior sets that can become career roadblocks. When others are observing the issues with someone who is stuck and has these blind spots, they frequently use terms to describe these roadblocks (e.g. “control freak” or “dinosaur”).